It will also include an extended terminal building, enabling it to serve two million more passengers a year by 2025. The remote digital system will provide controllers with a 360-degree view of the airfield via 14 high-definition cameras and two cameras which are able to pan, tilt and zoom. As well as being able to see it, controllers will be able to hear the airport, as if they were in situ. Unlike the old tower, the new system will allow controllers to zoom in for a better view and put radar data onto the screen to track aircraft. 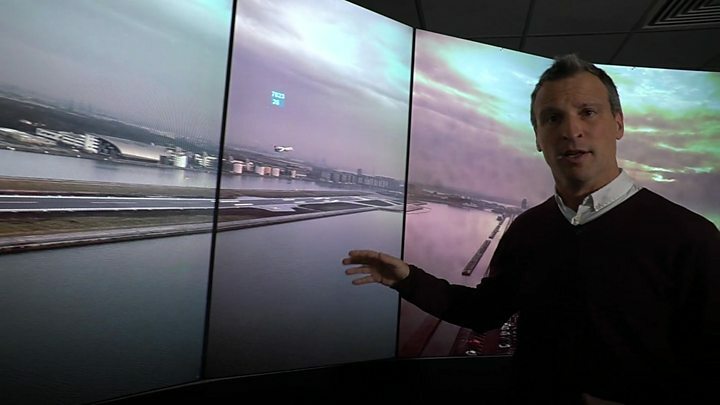 BBC transport correspondent Richard Westcott says a critical new safety feature means the cameras will be able to pick out rogue drones near the airport, as well as light the runway at night. Responding to questions about safety and potential system failure, London City Airport said it been independently stress-tested by security specialists. The system will use three different cables, taking different routes between the airport and the control centre, to ensure there is a back up if one of those cables fails. Declan Collier, London City Airport chief executive, said he was "absolutely confident" that the system is safe from the threat of a cyber attack. "No chief executive is complacent about threats from cyber security," he said. "But we are very confident that the systems we're putting in place here are secure, they're safe, they're managed very well." Steve Anderson, from Nats Air Traffic Control, told the BBC he has been won over by the technology after being initially "sceptical". He said: "They give the controller more information in terms of what they can see, what they can hear." The airport is planning to decommission its traditional tower in 2019, replacing it with a new 164ft (50m) digital tower - 104ft (32m) taller than the existing one. Nats airports director Mike Stoller said: "Digital towers are going to transform the way air traffic services are provided at airports by providing real safety, operational and efficiency benefits. "We do see this as being a growing market place across the UK and the world."